Welcome back to the Blogging Through the Bible Series! Today – we are moving into Genesis 4 and looking at the first dysfunctional family in history, Adam and Eve and their children Cain and Abel. Adam made love to his wife Eve, and she became pregnant and gave birth to Cain. She said, “With the help of the Lord I have brought forth a man.” 2 Later she gave birth to his brother Abel. First let’s note that Adam and Eve had a perfect father – the Heavenly Father…there was no reason for their sin. God did not fail them. So when our children make wrong choices, let’s remember to not always blame ourselves. Sometimes we can do many things right and our children still choose wrong. Next we note from this passage that Adam and Eve had two sons and the oldest was jealous of the youngest and so he killed his brother. UGH! Can you say – dysfunctional? I’m sad to admit that sibling rivalry began in our home the day we brought home baby #2. I had no idea there would be such a struggle to see who is the king of the hill! Since the beginning of time there has been sibling rivalry. Then there was Jacob and Esau – twins fighting over birth rights. And then Jacob showed favoritism toward Joseph and once again – sibling rivalry broke out over a coat of many colors. And then there’s Cinderella and her step-sisters – but that’s a whole other story right? 🙂 Lol! What brought about the murderous feelings of Cain? Jealousy. The Lord looked on Abel with favor and did not have favor towards Cain. Cain was even warned by the Lord Almighty to do what is right and he would earn the Lord’s favor but rather than doing the work to have what Abel had, Cain decided he’d destroy Abel. A content and satisfied person is not a jealous person. A woman with a deep walk and trust of God has no need to be jealous of anyone. She knows with confidence that if she is meant to have the thing she desires, God would give it to her. Character is developed in the waiting and in the temptations to covet. It’s hard to watch someone, who you may feel, has a worse voice land the solo in the church concert or to be passed by for a promotion at work. But in the midst of our dreams may we never become jealous of those who already have what we dream of. Jealousy will make us criticize, gossip and tear down another woman but jealousy has nothing to do with the other person- it’s demonic. It is not from God. It is sin and it’s a lack of trust in God’s will for your life. This is a hard truth right? But we can’t chase after things – we must chase God! What causes fights and quarrels among you? Don’t they come from your desires that battle within you? 2 You desire but do not have, so you kill. You covet but you cannot get what you want, so you quarrel and fight. You do not have because you do not ask God. Jealousy leads to fighting and in Cain’s case – to killing. But why do we not have what we desire? James 4 says, “because you do not ask God.” The way to get what we want, is to ask God and if He wants us to have it – He will give it to us. We can’t always help the first time we feel the feelings of jealousy – but we can help the second time we feel this way. Once we detect this sin, we must attack it with confession, prayer, scripture and accountability. We must rule over it! Jealousy is truly hatred which is why it turned into killing for Cain. Now consider this, the first four disciples Jesus called to follow Him were two sets of brothers! (Simon-Peter and Andrew, then James and John) Jesus called siblings to be His disciples. These siblings obviously did not have rivalries like the previous list I mentioned. They shared a heart for God and a passion to serve him and together they were greater than when they stood alone. Let’s raise children who do not rival one another but love each other. Let’s teach our children how to rule over this temptation by leading them to desire God more than anything else on earth. Let’s strive to be content and satisfied with the lot in life God has given us today. Let’s support our birth sisters and our sisters in Christ and be happy for them when they receive blessings from God. Remember, this issue of the heart has nothing to do with others and everything to do with our own character. 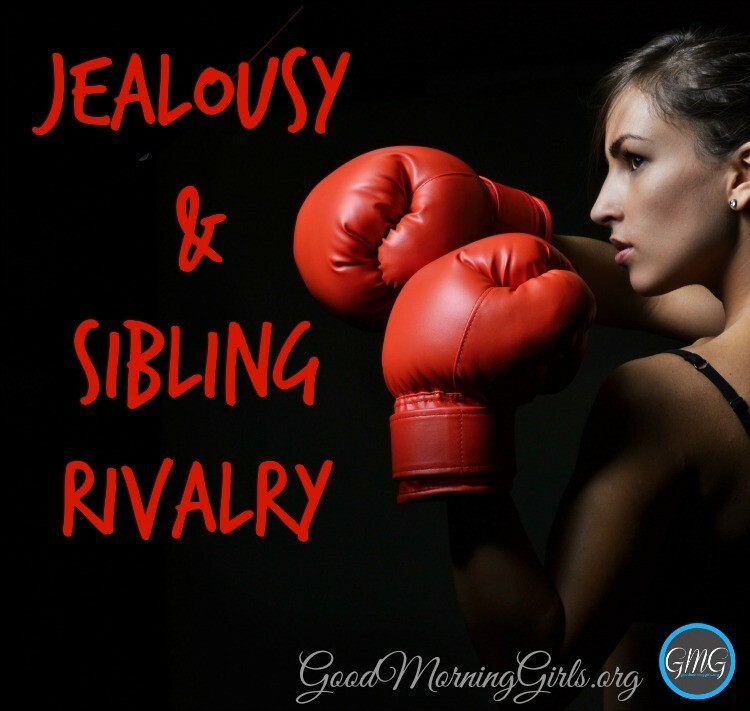 Have you experienced a struggle with your birth siblings or sisters in Christ that was rooted in jealousy? How do you find contentment when jealousy tries to sneak in on you? What verses do you turn to, when you are facing this struggle? How do you attack it in your life? What else is God teaching you through your reading in Genesis chapters 1-4? I’ll meet you back here this Friday with a video covering Genesis 6! If you need the materials for Genesis – they are available here. Wow!! This post is SO encouraging!! I have been struggling w/ jealousy not of my earthly sibling, but of women at church who seem to have “more” of this or that. Thank you for writing this, I’m going to print it so I can really pore over it. I love what you wrote about jealousy. It grieves my heart to see all of the discord around us WITHIN THE FAMILY OF GOD!! I see it in churches, a seminary an old college friend teaches theology at, here on the internet with a women’s bible study group. It can really bring down the spirit of those of us seeking to grow closer to God and be His instrument in this horribly fallen world. Satan is having a field day wreaking havoc among the people of God. He’s using our self-centeredness, pride, and jealousy to rip the body of Christ apart at every turn. It’s time for the children of God to WAKE UP! So while I really love and appreciate your lesson today, it leaves me wondering: have can people who write such good, biblical lessons still have a major rift with another seemingly Godly group of ladies who write equally biblical and challenging lessons. And please, please don’t respond in your heart or any other way before truly hearing me…I am grieved…I am sorrowful…I am just trying to wrap my head around all of the division I see. We all need to THINK! PRAY! And DAILY place ourselves at the feet of Jesus and seek to honor Him and Him alone…our only agenda should be His. Praying for you, for me, for ALL in the body of Christ that we will make everything we do TRULY about Him. Thank you for your prayers Patty. I need them. Genesis 1 – God shaped and molded the earth and all He created – including us! He is shaping and molding us every day to become more like Him. Genesis 2 – God provided a beautiful garden for Adam and Eve to love in. This was and still is His desire for His children – to bless us and provide good for us. He wants to take care of us with Hos love. There is no fear in love. (1 John 4:18). I loved what you wrote about jealousy today, I have been struggling with jealousy/envy over my friends who get to have more babies, get to go on trips., etc and I don’t. This post was a good reminder to trust The Lord and be happy for what I have instead of focusing on what I don’t have. I enjoy reading your thoughts on the chapters as I struggle to get the level of application/analysis that others are able to draw from the days reading. Thank you! I’ve really enjoyed reading through the bible so far. Some say how can jealousy exist in the body of Christ…simple..we are sinful human beings who make mistakes every single day….we pray to God for Forgiveness and guidance. and the next day we start over again. We will never be perfect but striving to be a little less sinful every day is good start. Loving this study…..
Ah, jealousy. I have been seeing it in the form of bitterness, towards my husband. Though not 100% accurately placed, I have two little children, we’re still in the harried stage of sleepless nights, lots of tantrums and fussing. Momma get’s harried..and would like a break, but doesn’t always get one. So instead of going to the feet of God, who can REALLY give me the break, peace, joy and contentment I need in those moments, I get upset that my husband get’s what I want..haha…sigh. I’m a work in progress, but what a process! I am so beyond ecstatic that you shared this Courtney! I struggle with jealousy/competition with my sister in law. She is my best friend who married my brother in law, and words were said among other family members about how she was gonna be the new better version of me and maybe this one will give your mother in law a grandchild….and so the seed of jealousy was planted. I have struggled with it ever since. Now they have had a baby of whom I adore! I had been doing better with that struggle but now it has reared its ugly head again….UGH! Mostly to the sound of “Well, now its your turn” resounding from family. It is a daily struggle, and I find that if I pray for her and do my best to encourage her and be happy for her the struggle dies down. And I try to remember that there is no need to compete when I am complete in Christ. This couldn’t have been more timely for me and I don’t get to read your emails everyday but decided to read this one. I was just passed over for a promotion (yesterday) and I have not admitted to myself that what I’m feeling for my friend who got it is jealousy. I’m fighting negative feelings and thoughts, fighting to trust God has my best in mind, but if I can’t admit the sin of jealousy it’s not going to get me past this time. And I challenge us all to not only fight against jealousy with our brothers and sisters IN Christ, but also those OUT of Christ, like this sister of mine. How better to show the light of Christ to them than to not stay in jealousy and sin! Oooppsss….it was supposed to say, “Train up a child…” referring to the bible verse! Amen to this post today! Every once in a while, familiar Bible stories that I have heard over and over growing up, really resonate with me as an adult. As a 33 year old, I continually have to slay the jealous attitudes when it comes to friends getting married and having babies. I am lucky that the Lord is ALWAYS there, and I go to Him constantly, knowing that whatever He has for me will not pass me by. It is a desire of my heart to be married and have children, and honestly, desire more often than not turns into jealousy instead of being content with the season I am in. It is an on-going work in progress, but one I know I am victorious over every time I go to the Lord in prayer, open my Bible, and realize that I need to appreciate this season! Thank you for this post! I love following along, and I am beyond thrilled that I found your blog last year! I read this years ago on the bottom of my devotional. It said, “Comparison is the biggest killer of contentment.” Isn’t that so true. We are perfectly fine til our friend gets a new vehicle or a pool or whatever. Speaking of the big bang theory or evolution, if you have not seen the movie God is Not Dead, I highly recommend it. Very very good. Excellent youth group choice as well. It always fascinates me when people get different things out of the same verse(s). I totally wasn’t focused on the jealousy aspect, even though it is right there under my nose. What struck me was how God asked Cain where Abel was. God asked Adam and Eve where they were after they sinned as well. I saw a Father, who knows what his child has done and giving him a chance to repent. A chance to fall on their knees in remorse. How often do we ignore God’s instruction and then avoid getting in His Word or praying because we want to hide. But He knows and He is right there waiting for us when we answer His call. I also noted that just like Adam, Cain’s punishment revolves around work/toil for food. Courtney, do you think jealousy had a role in the sin of Adam and Eve. It struck me when reading this post that perhaps Adam and Eve were jealous of what God had that they didn’t – the ability to know good and evil – and the desire to have something that was forbidden to them was part of what drove them to disobey God. Just a thought. The main thing I see in this chapter is sin & consequences. I see 4 main sins in the account of Cain killing his brother Abel. (1.) disregard for offering what was an acceptable offering to God (pride/going your own way) (2.) uncontrolled anger/jealousy (3.) murder (4.) lying/not taking responsibility for his actions. I think the jealousy was not where the murder began. I think it began with pride – Cain thinking he was above God’s ways – and that was evident in his disregard for bringing a proper sacrifice. With us, if we are jealous of what another has aren’t we telling God that we know better than He does what we need and that we deserve to have what someone else has? I think pride and jealousy go hand in hand. The consequences for Cain’s sin were very difficult for him to bear . He could no longer successfully farm (loss of what he loved), he became a restless wanderer (away from his family in the land of Nod, and never feeling satisfied), and he feared being killed for what he had done. I also see God’s protection of Cain (God’s mercy) in that he marked him so that others understood the consequence of taking Cain’s life. I was very overwhelmed in chapter 3 with the love of God because even though Adam and Eve disobeyed God (sinned) He was so very merciful and loving in his protection (keeping them from eating from the tree of life and living in their sinful state forever), and provision for them (for their sins and a covering for their bodies). I am continuing to see God’s mercy and love in chapter 4. I believe it is a central theme throughout the scriptures. Lovely post Missy, you certainly have deep insight into the Word. He ends up MURDERING his brother. We go from DOUBTING God’s word to MURDER in just one generation. Just shows how quickly sin progresses. Great post and great comments today, thanks! I do wish you had done a post on creationism vs evolution. I have an honest question that I am always afraid to ask because it is a very divisive issue for many people, but I promise this is an heartfelt question . . . not asked to “stir the pot”. I believe in an all powerful God who intricately CREATED the world and everything in it, including humans in His image and likeness . . . through a process called (by this world) evolution. If we believe that God’s time is not our time, and that ages in heaven pass in the blink of an eye; and we further believe that God has a plan for every step and every moment in our life (both of which I wholeheartedly believe) . . . then why couldn’t it be the same with the world? I am truly and honestly curious. Not sure I should hit enter . . . but here goes. Hi Kathy. I’m obviously not Courtney, but I wanted to share some thoughts with you on this issue. I believe your question is very valid, and yes it does stir controversy but it should be addressed. I believe the answer to your question lies in the original language of Scripture. I use a handy little tool called blueletterbible.org because it has so many Bible study tools available. That resource tells me that the Hebrew word for day is “Yowm” and that in Genesis 1 it is a 24 hour period. If you will notice on each of the days of creation the text states “there was evening and morning the “x” day”. I believe God is making it clear here that this is a 24 hour period because He has added “evening and morning” and a number with the word day. Most people pair evolution with the days of creation using 2 Peter 3:8. I believe that this verse is not speaking of a 24 hour day as Genesis 1 does since their is no number or “evening and morning” attached to it. Also, the reading of the passage itself seems to indicate that it is speaking of time in general. See http://creation.com/2-peter-38-one-day-is-like-a-thousand-years for a little more detailed explanation (you will have to scroll down past the video). If you are following the evolutionary timeline the dinosaurs died out before man “evolved”. This is contrary to Genesis because there was no death on the earth until Adam and Eve sinned. In Genesis 3:19 Adam is told that one of the consequences of their sin was death. In Genesis 3:21 God made clothing for them from the skins of an animal. This is the first time that we see the death of an animal in scripture. I hope these things help you. Thanks so much for taking the time to answer in such a nice way. I actually tried to delete my comment after I posted it (wasn’t able to!) because I do NOT want to stir up controversy on this wonderful site, that does so much good for so many people. (I am one of those people!) I appreciate your in-depth reply, and I will certainly follow through with more study. I appreciate it! I’ve been struggling this past year with jealousy. It’s ridiculous when I feel jealous that someone else is getting attention or raising more money than me for their charitable work. I desire to make an impact and struggle to trust God to provide for projects, I put it on myself. It’s stupid & sinful. This past 18 months has been so hard ministry wise & I’ve let sin overtake me more than I would like to admit. This post was a good reminder. I think everyone needs to be reminded of this lesson from time to time. There are times when I wonder if social media is used for nothing more than the devil’s work. This post is such a great reminder that others feel that life is not a competition. Thank you! I am new to this blog. How do I find the video on Genesis 6 you referred to? My best friend and I were referred to your group as a way to start reading our Bibles. We started a few days ago. We are simply following the My Bible Reading Plan you posted. Therefore, we are simply starting with Genesis and going forward. I LOVE all of the things you posted in the Genesis 4 resources under GMG resources. I can see that this will truly be a great place to help guide us through our first official attempt in reading, understanding and pulling real life applications from the Bible. At age 34 I wish it hadn’t taken us this long – but so happy we found you! I’m so excited to hear that you are doing this with a friend! That is WONDERFUL!! This was so encouraging and exactly what I needed. Lord I confess that I have been covetous lately of other women in my life. And it’s a real struggle of mine. Of their beauty, abilities, and success. Of their freedoms and lifestyles. I’m ashamed of myself. Lord help me. I’m ready. I need to change. I’m sorry. Forgive me. Trying to be encouraged my sister has displayed jealousy of me for over 35 years even to the point of putting me in harms way. i have repressed a lot of things from childhood but they are rearing their ugly heads and I’ve tried addressing it with her. She has admitted the jealousy but denied that she has hurt me which she has many time over. Please pray for me I have been dealing with sisters who are jealous of me. One is now sixty and asked me why haven’t I killed myself yet due to sickness! Thanks really hurts. All I want is to be loved and accepted.